JSPatterns.com » Blog Archive » js4php: thanks! 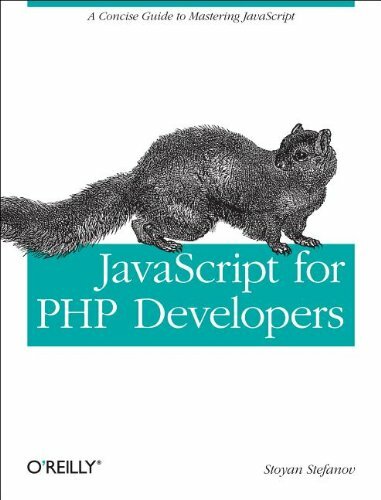 JS4PHP book is almost a wrap! It started as "well, I have this blog post, then I have these slides from this conference, how hard could it be to make it into a book form?" Pretty hard, turns out. I'm surprised every time. Takes a while, you get distracted by something shinier and so on... No such thing as "quick book project", for me, at least. But it's almost ready to go, O'Reilly folks are optimistic it will be done in time for the Fluent conference in May (where I'm not speaking btw). The price on Amazon really makes me happy, I think $7.90 for a tech book is unheard of. So anyway, just wanted to say thanks to people that helped with the book along the way. Many thanks to Chris Shiflett and Sean Coates. They made sure the PHP side of things make sense, but what's more, this whole book started as a post on their PHPAdvent (now WebAdvent.org) blog, followed by a talk at the ConFoo conference which Sean helps organize. Finally, thanks to Randy Owens who read the "early release" of the book and meticulously filed tens of errata reports. This entry was posted on Monday, April 15th, 2013 and is filed under books. You can follow any responses to this entry through the RSS 2.0 feed. Both comments and pings are currently closed. Entries (RSS) and Comments (RSS). 24 queries. 1.316 seconds.